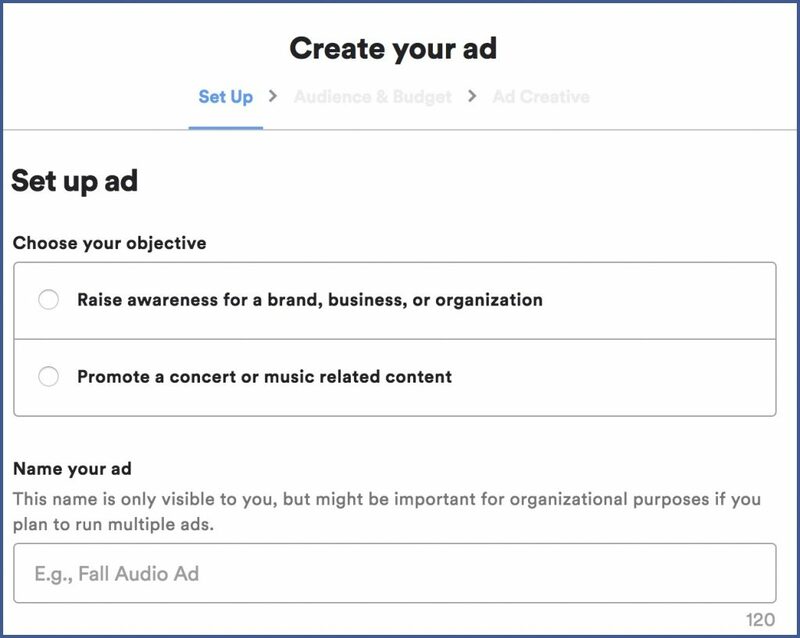 Although most of us use visual creatives for advertising, which a Facebook advertising company does, there’s another option we should (but don’t often) try: audio ads. 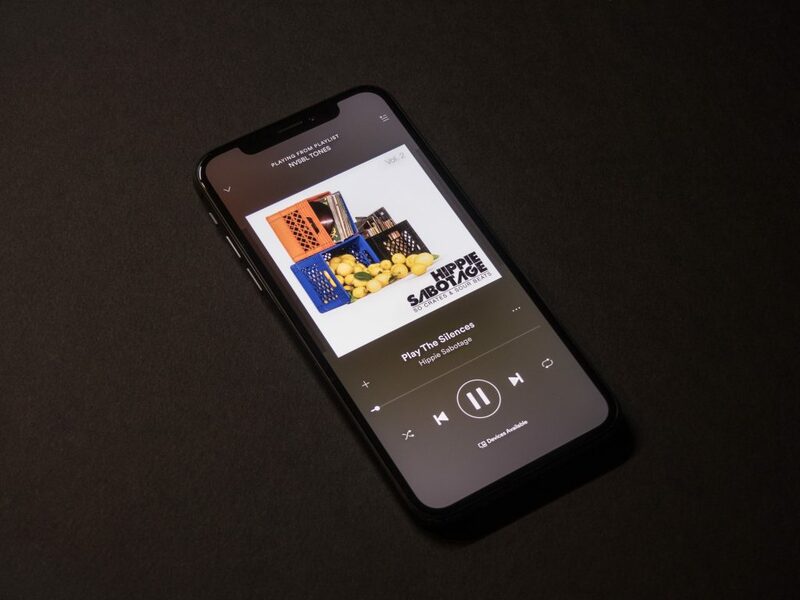 Just as effective, audio ads are especially impactful when they’re delivered through a popular digital music service like Spotify. Spotify gives music lovers access to millions of songs. Since people listen to music on Spotify on a daily basis, you can create audio ads that will play intermittently between songs. Fifteen or 30 seconds in length, these ads play naturally during a transition from one song to the next. 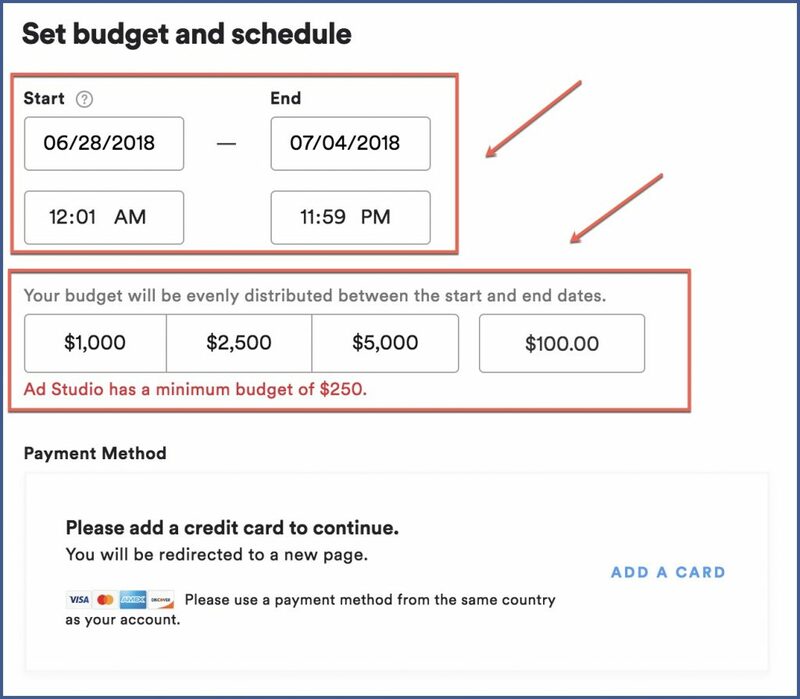 Increased efficiency-You can plan, buy, and manage audio ad campaigns in a matter of minutes directly in the platform. Budget flexibility-Run campaigns of any sized budget. Free audio ad creation tool-When you don’t have pre-produced audio assets, you can use the platform to create audio ads for free. Spotify Ad Studio is the self-serve platform you can use to create audio ads for Spotify. You can either upload your own audio or write a script for which Spotify will provide a voiceover actor. 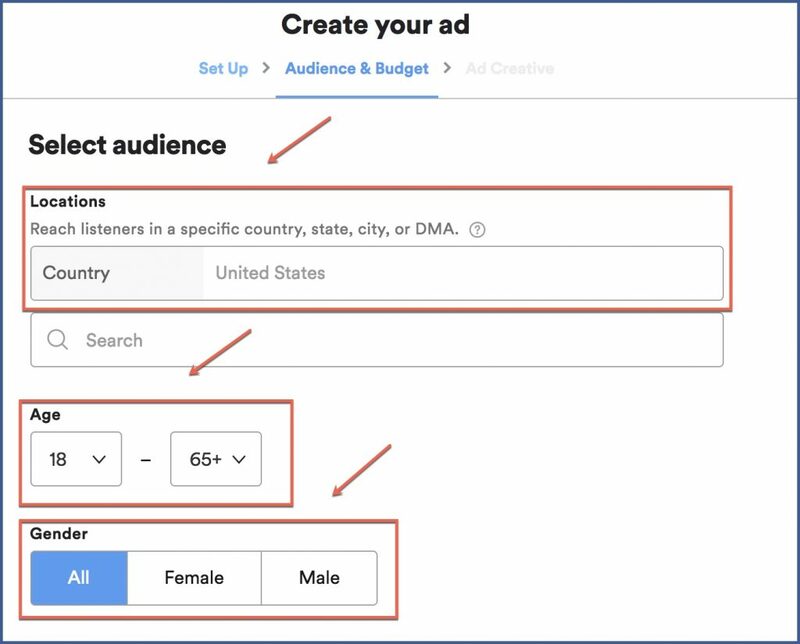 Ad Studio also offers targeting settings that make sure your message is delivered to the most relevant audience at the right moment. Step 1: Choose your objective and name your ad. Step 3: Specify your budget and start and end dates. Step 4: Create your ad. 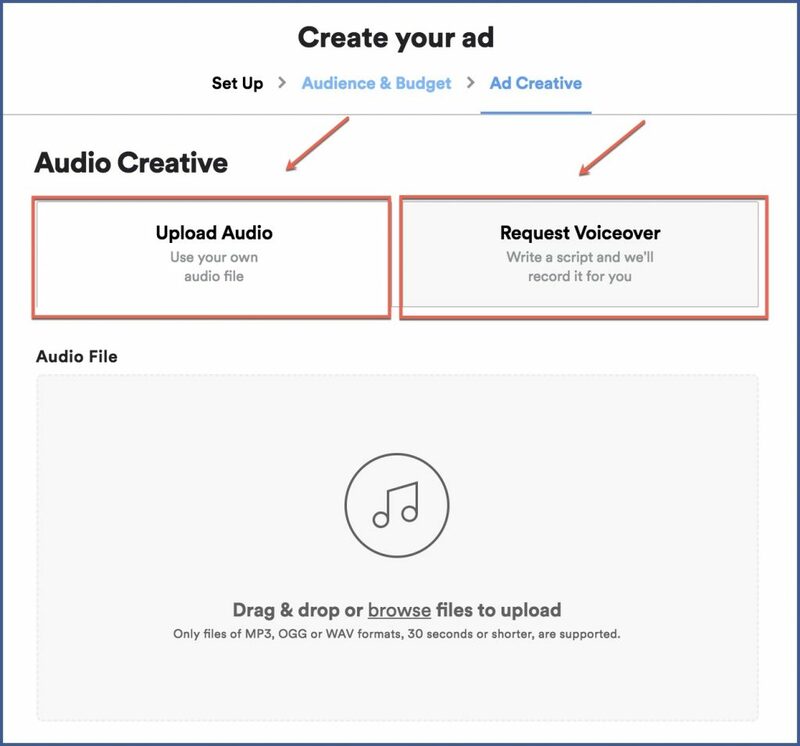 You can either upload audio you’ve already created with the “Upload Audio” option or a script you’ve written with the “Request Voiceover” option, which Spotify will give to a voiceover actor to read for you. Step 5: Upload an image to display on listeners’ screens while your ad plays. 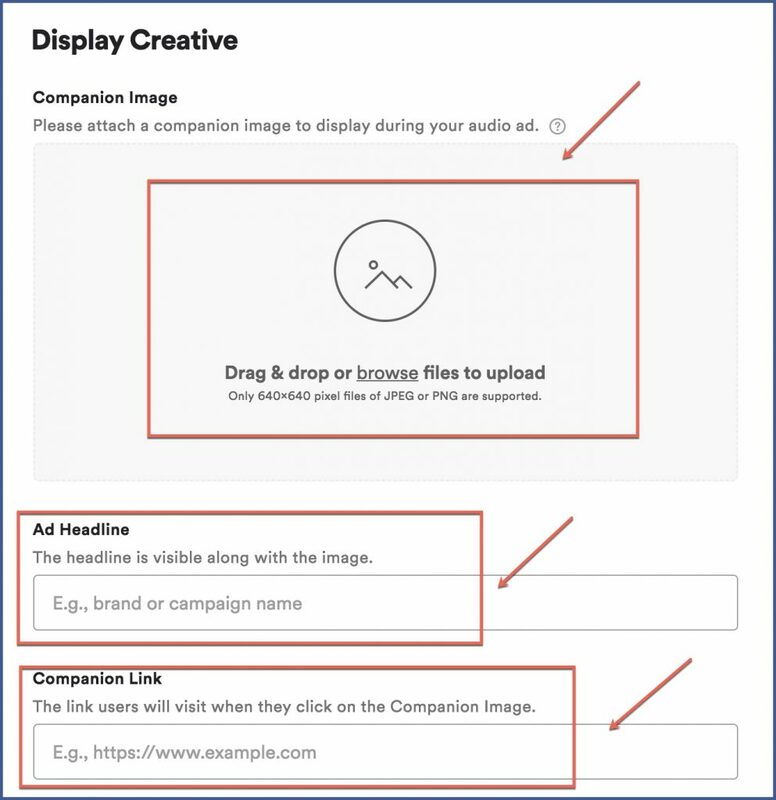 Also, enter a headline for your ad and a companion link, which will direct users to where you want them to go after clicking the ad. In no time at all, you have your audio ad. It takes only a matter of minutes to reach a worldwide audience. So if strictly visual ads aren’t cutting it for your campaign, try shifting gears and appealing to people’s sense of hearing. They’re already on Spotify to listen. Let them listen to what you have to say.